Caption: Angela Hunt, Judy and Rowly Paterson, Allan Bawden and Anthony Camm. Community support for Ararat’s historic arts precinct is gathering momentum with a major donation from prominent community benefactors. 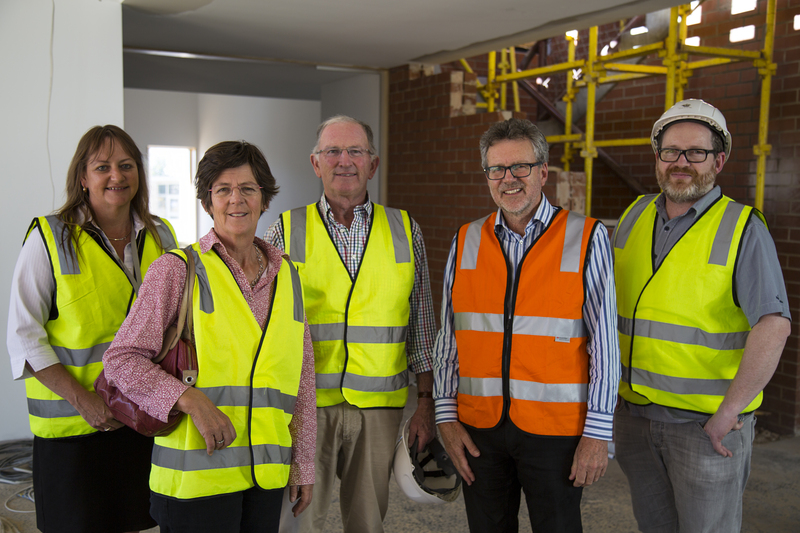 Rowly and Judy Paterson, owners of Ace Radio and The Weekly Advertiser, have made a significant contribution towards the precinct redevelopment, which has been touted as Ararat Rural City’s most “complex project” to date. Mr Paterson said he felt it was important to ensure residents of Ararat and surrounding regions could access the sorts of cultural experiences that were available to their city counterparts. “The arts are an important part of the mosaic of life in a town like Ararat,” Mr Paterson said. The Ararat Arts Precinct redevelopment, which is on track for a mid-year completion, has been funded via a partnership between the Ararat Rural City Council, the Victorian Government ($5.2 million), the Federal Government’s National Stronger Regions Fund ($945,000) and the regional community. To date, the community has raised almost $250,000 towards the project. Ararat Rural City Council Chief Executive Officer, Allan Bawden said the community contributions would enable important finishing touches to be applied to the revamped art gallery and performing arts spaces. “It was always a condition of our government funding that the community would also make a financial contribution to this project,” Mr Bawden said. Mr Paterson said he looked forward to seeing the redeveloped precinct completed and re-opened later in the year. “I’ve no doubt that the work that has been done on the site will pave the way for an expanded arts program in Ararat. Community contributions can be made by contacting Gallery Director Anthony Camm, email acamm@ararat.vic.gov.au or phone 5352 2836.